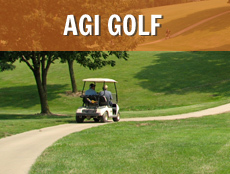 AGI’s fundraising events are also “friendraising” events, bringing people together to support a great cause and enjoy a favorite activity or sporting event. You can purchase your tickets or sponsor any event below… just click on the links! A Fashionista’s dream come true! Montreal’s socialites donate their gently used designer wear to AGI to be sold at an exciting weekend long shopping event. It’s a unique opportunity for the fashion loving public to benefit from low prices for great designer items, including clothing, handbags, shoes and scarves, AND shop for a great cause! Vintage Recall usually takes place the first weekend in May. It all begins with an exciting Vente Privée Cocktail evening, where guests get a first glimpse and opportunity to purchase incredible fashions. 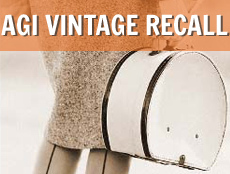 Beginning the following day, AGI's Vintage Recall sale opens to the public for free. For more information: contact us at 514-485-7233 or info@agiteam.org AGI’s Annual Gala event is an important date on Montreal’s late spring social calendar. It’s a sparkling celebration that highlights the generosity of the AGI’s supporters whose important contributions help Alzheimer Groupe continue to provide vital support services for those in need. 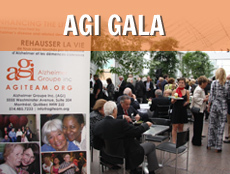 AGI's Gala takes place in May at the Montreal Museum of Fine Arts. Contact AGI at 514-485-7233 or info@agiteam.org for more details. Fore! Our Annual Golf tournament is a big hit for golfers of all levels! Golfers are treated to a lavish breakfast and 18 holes of GREAT golf with a shotgun start and exciting contests and prizes. When the golfing’s done, the party begins. Great food and beverages served dinatiore style with auctions and prizes top off an incredible day. For more information and for sponsorship and golf participation opportunities, click here or contact us at 514-485-7233 or info@agiteam.org AGI’s Amazingly FUN Race is a unique team building experience that combines adventure, excitement and the thrill of the chase. Teams complete different challenges along the way, collecting as many points as possible, while searching for and following clues throughout Montreal. 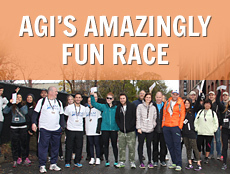 AGI’s Amazingly FUN Race brings together AGI supporters who, through their social networks, generate much-needed funds for Alzheimer Groupe Inc (AGI).